Despite the project's low budget, the production is nothing short of impressive, especially for a high school play. The project's art director, art teacher Steven Defendini, says there were audible gasps from the audience once the curtains were drawn and people could see the set and astronaut costumes. "When the actual alien appeared they were screaming," Defendini says about the Xenomorph's appearance on stage. Not foreseeing the production quickly going viral, Defendini later saw photos and videos from the show being shared on social media, and he soon began receiving phone calls from various news outlets. Due to its immense popularity, Defendini is hoping the school will allow the students to perform the stage show once again. It's hard to tell at first glance just how low the budget was for Alien the Play. Each of the show's 15 sets were built by Defendini and the six student performers themselves. They also handcrafted the costumes, which included four astronaut costumes and two aliens. The astronaut costumes were described as being made from moving blankets and thrift store pants, with the helmets crafted from floor mat foam and bottle caps. "We don't have really any budget - we recycle everything, everything is repurposed and recycled 10 times over until we get the look we need," Defendini says, adding he'd even drive around on recycling day looking for items he could use for various props. Directed by Ridley Scott and written by Dan O'Bannon, the original Alien was released on May 25, 1979. The movie focuses on the a team of crew members on a spaceship coming under attack from a deadly and vicious extraterrestrial species. Sigourney Weaver stars in the movie as fan favorite character Ellen Ripley, along with Tom Skerritt, Veronica Cartwright, Harry Dean Stanton, John Hurt, Ian Holm, and Yaphet Kotto. On a budget of less than $12 million, the sci-fi movie grossed more than $203 million worldwide, spawning a beloved franchise that's still ongoing four decades later. Opinions may be divided on the various sequels, but everyone can certainly agree that the original Alien movie is pure gold. 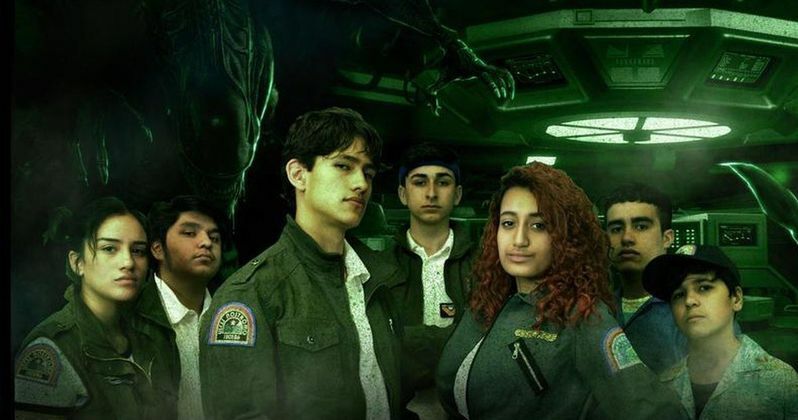 To celebrate the 40th anniversary of the original movie's release, 20th Century Fox will be releasing six new live-action shorts set in the Alien universe. From six different directors, each short film will be released weekly on IGN beginning on March 29. With Alien Day just around the corner as well on April 26, it's a good time to be a fan of the franchise. Information about the high school play comes to us from Buzzfeed News.